The months’ supply remained below the 6.0 months that is normally considered as a healthy balance between supply and demand. The median US home sales price in August rose 14.7 percent from a year ago to $212,100. Distressed properties, foreclosures and short sales, which typically occur at deep discounts, accounted for about 12 percent of overall sales last month, the lowest since NAR began tracking the data in 2008. This is great news!!! 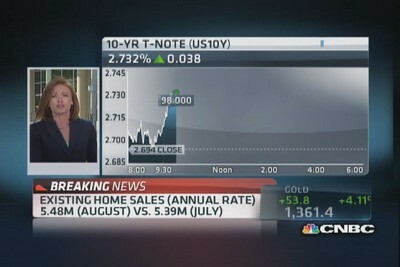 Despite slightly rising mortgage rates it is a good time to sell and buy-up! This entry was posted in RE/MAX Evolution News, Real Estate, Real Estate Industry News, Residental Real Estate and tagged Home Sales, Mortgage Rates, Resale surges. Bookmark the permalink.